Canadian government ministers lined up to praise Chrystia Freeland before the cabinet meeting on Thursday. OTTAWA — Canada on Thursday shrugged off U.S. President Donald Trump's criticism that talks to modernize NAFTA were moving too slowly and made clear it had to keep negotiating as long as there was a chance of success. The prospects for a quick deal to update the North American Free Trade Agreement appeared to dim on Wednesday after Trump blasted Canada's stance and threatened to impose tariffs on cars imported from Canada. "But a good fair deal is still very possible. We won't sign a bad deal for Canadians," he added, saying his office had not requested a private meeting with Trump. He declined to answer when asked whether Trump had lied. The United States has imposed a Sept. 30 deadline for Canada to agree to the text of a new NAFTA. The 1994 deal underpins US$1.2 trillion in annual trade between Canada, Mexico and the United States. Canada, which sends 75 per cent of its goods exports to the United States, is vulnerable. The Canadian dollar weakened to its lowest in more than two weeks against the U.S. greenback early on Thursday before recovering slightly. "Plan A, B, C and D is NAFTA. If the government listened to everything the Trump team said about the negotiations we'd never get anything done," said one source with direct knowledge of Ottawa's stance. That said, insiders have consistently played down the idea that U.S. pressure could be politically damaging for Trudeau's ruling Liberals, in the short term at least, predicting opposition politicians would be forced to back the government at a time of crisis. 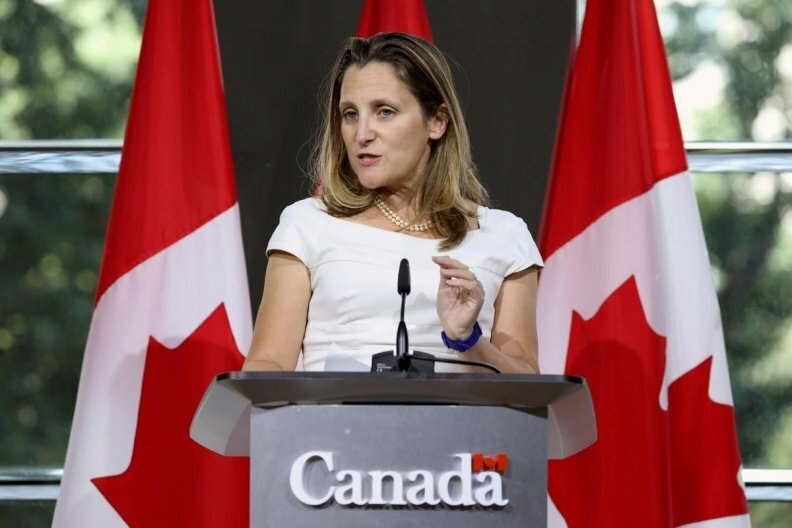 Trump also appeared to attack Canadian Foreign Minister Chrystia Freeland on Wednesday, saying the U.S. team did not like Canada's representative at the talks.